The first people to cross into North America from Eurasia did so by traveling through the Bering Strait, or so the theory goes. A new theory has emerged proposing a coastal route into the continent, but evidence has been lacking. A recent analysis of boulders, bedrock, and fossils in Alaska is now providing a clearer picture, pointing to the emergence of a coastal route some 17,000 years ago. New research published today in Science Advances is offering some of the first geological evidence of an Alaskan coastal migration route that would have made it possible for humans to cross over from Eurasia into North America when the Ice Age was still going strong. Importantly, the paper also includes evidence of aquatic and terrestrial life in the region during the same time period, which means venturing humans would have had access to food. The University at Buffalo researchers aren’t saying humans definitely traveled along this coastal route—they’re just saying the conditions were set for human migration into North America starting around 17,000 years ago. At the height of the last Ice Age, North America was separated from Eurasia by the massive Cordilleran Ice Sheet, preventing the flow of humans into the continent. Eventually, humans were able to make the trek, but scientists aren’t entirely sure which route they took, or the timing of the transcontinental leap. During the 20th century, it was conventionally assumed that North America’s first peoples travelled through a narrow, ice-free corridor, but recent evidence has thrown a rather large wrench into this long-standing hypothesis. The retreating ice sheets didn’t yield an interior pathway until about 14,000 years ago, and the strip of land that suddenly became accessible wasn’t suitable for animals and humans until about 13,000 to 12,600 years ago. This presents a huge chronological problem, because archaeological evidence places humans in Chile around 15,000 years ago, and in Florida some 14,500 years ago. Hence the Coastal Migration Theory, also known as the Kelp Highway Hypothesis. Instead of traveling through an interior route, it’s counterargued, human migrants hugged the Siberian, Beringian, and Alaskan coastlines, eventually making their way into North and South America. There’s practically no archaeological evidence to support this theory, but the recent discovery of 29 footprints on the shoreline of Calvert Island in British Columbia, dated at 13,000 years old, teases at the possibility. Complicating matters, scientists aren’t even sure if the glaciers completely blocked the coastal route, or when the ice sheets retreated to make the route available for human migration. The research team traveled by helicopter to remote sites within the Alexander Archipelago in southeast Alaska. To answer these questions, Lesnek’s team visited four islands within Alaska’s Alexander Archipelago, which is located about 200 miles (360 km) south of Juneau. Looking at the physical evidence, it was clear to the team that ice once dominated the area. Using a technique known as surface exposure dating, the researchers were able to figure out when the ice began to retreat. Chemical signatures within the rocks and bedrock tell scientists when ice no longer provided a barrier to the elements. Lesnek and her colleagues were surprised that glaciers blocked the coastal route. Her team went into this project thinking that these areas had been completely ice-free during the last Ice Age. “But our results tell a different story,” she said. University at Buffalo PhD candidate Alia Lesnek at work on Suemez Island. This paper addresses a major gap in our knowledge about how, and potentially when, humans colonized the Americas. Importantly, the new study only covers a very small portion of the coastal route, and other parts still remain undated. Lesnek says her team will continue to hunt for areas that may have escaped glaciation, and map the areas in which life was able to emerge in the immediate aftermath. Ben Potter, a professor of anthropology at the University of Alaska Fairbanks who wasn’t involved in the new study, likes the new paper, saying the conclusion is plausible and that the researchers were wise to limit themselves to the notion that an early migration route along this part of the coast was possible, rather than saying it was likely or certain. 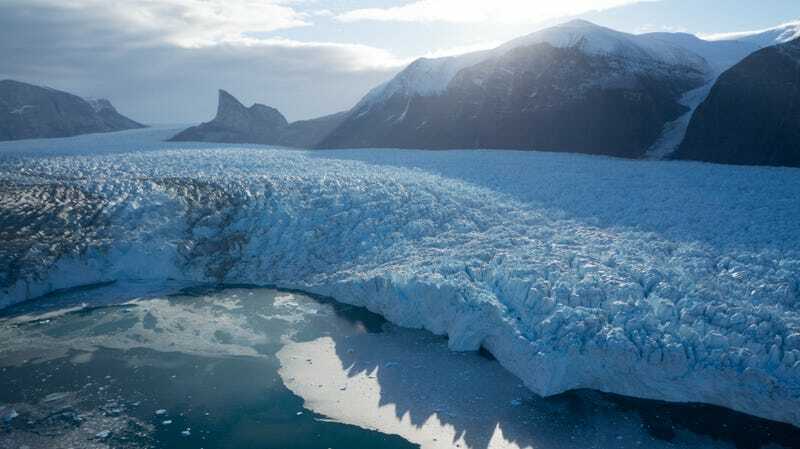 Potter said scientists should continue these types analyses along the coast to learn more about the timing of glacial retreat, and to track changes in the environment and ecology during this critical time period. But he says the ultimate answer to the timing and nature of North American colonization will likely remain elusive for some time to come. He says the routes taken may have included the interior ice-free corridor, the coastal route—or, more likely, both.